As with any measuring or control system, maintenance and adjustments should be performed by qualified personnel only. Prior to any adjustments, the Operations Authority must be notified. 1. 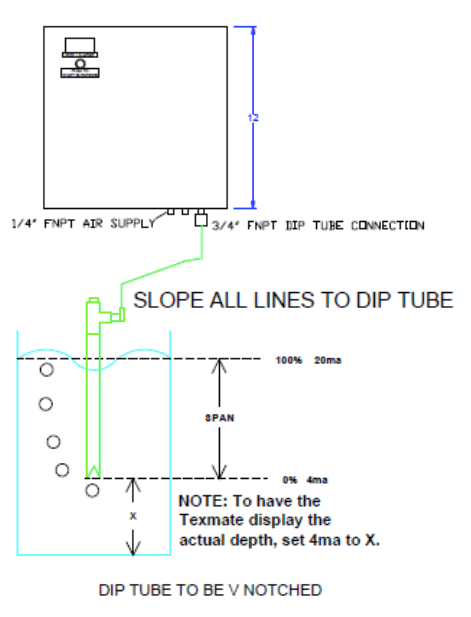 Mount Bubbler panel and connect air supply and dip tube and lead line tubing to Bubbler panel, per Panel Layout drawing. 2. Connect power supply to panel per wiring diagram. 3. Confirm the air filter output to the Siemens Constant Flow regulator is set to X psig (where X is equal to the maximum depth being measuring plus ~30% margin; 1ft H2O = 0.4335 psi water). 4. Confirm the Siemens Constant Flow regulator is set to 1 SCFH. 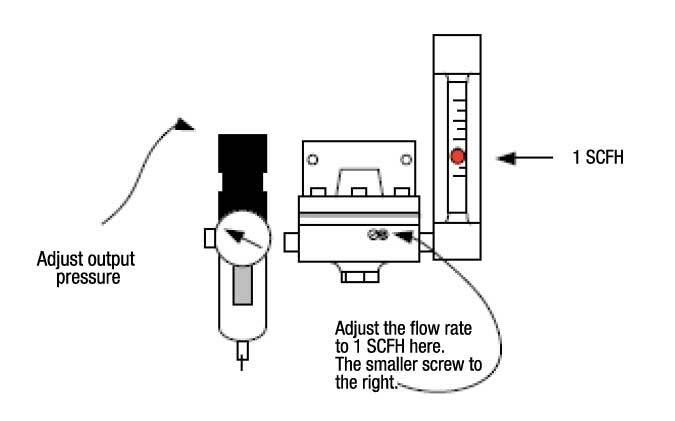 If not, adjust the flow rate by turning the smaller screw located on the bottom right side of the controller. 5. Adjust Alarm Level settings of Texmate as desired. See page 6 of Texmate manual provided. 6. For Texmate to display the actual depth, the 0% 4ma analog output must be set to the distance between the bottom of the V notch on the dip tube and bottom of tank. See Step H on page 5 of Texmate manual. 7. For Auto Blowdown systems, the cycle time is initially set to 24 hours unless specified. This Cycle Timer is the only timer that would ever need adjustment within the PLC program. Do not alter the other timers that open and close the solenoid valves or reset the auto cycle marker. A. The Dip Tube material must be compatible with the process fluid. B. The hydraulic lines and associated connectors from the bubbler to the dip tube can be of any material capable of withstanding the maximum pressure applied. C. The Dip Tube should be V notched ¼” at the bottom to ensure the continuous flow of small bubbles. The Feeder line should be sloped toward the dip tubes to avoid any condensate traps.